Kansas Attorney General Derek Schmidt appointed a Youth Suicide Prevention Task Force in June. Schmidt knew there were small organizations around the state helping fight the stigma and help teens, but he wanted to broaden it. TOPEKA, Kan. — Kansas Attorney General Derek Schmidt appointed a Youth Suicide Prevention Task Force in June. Schmidt knew there were small organizations around the state helping fight the stigma and help teens, but he wanted to broaden it. "One of the things I noticed is that death by suicide for the under-18 category had been steadily rising," Schmidt said. "... There was a lot of momentum and engagement, but we knew it was really uneven. So, we asked the task force to take a more big-picture look." The task force got input from organizations, parents and survivors across the state who had been impacted by teen suicide, including Jen Levinson. "I am a suicide-attempt survivor," Levinson said. "I struggle every day." Levinson was 15 when she tried to kill herself. Now, she uses that painful memory to encourage others through "Speak Up" , a community-outreach organization that works to combat teen suicide. Levinson shared her story with the task force and made a plea to find ways to help these teens. "We all need to be worried about all of these kids, because last year we lost 15 kids in Johnson County," she said. "We actually lost more than 15." "We need to do a better job at getting more mental health resources in communities, especially our rural communities where the wait can be terribly long," Schmidt said. 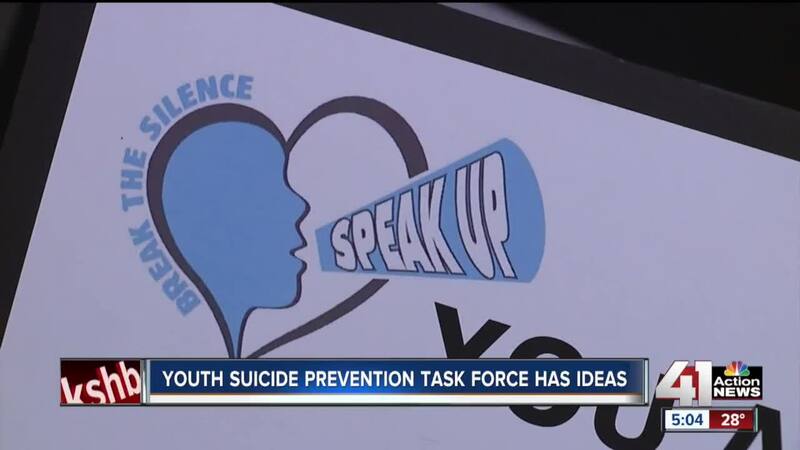 The task force also suggested developing an app to help at-risk youth and creating a Kansas Youth Suicide Prevention Coordinator, changes and innovations Levinson hopes will help. "We are talking about it, so I think that's a great step," she said. "We now have the words. Let's make them congruent with some action."